Meet Surena 2, a human-sized, human-shaped (ish) robot that’s new on the world robotics scene. He’s capable of walking, and designed to perform the similar sort of human-assist role as other similar bots. He’s from Iran. What? 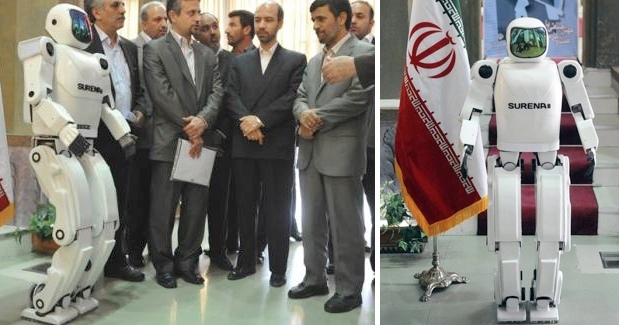 Surena 2 was unveiled recently in front of none other than President of Iran Mahmoud Ahmadinejad. He’s 1.45 meters tall, weighs in at 45 kilos and, according to the state news network, is “designed and developed to be used in sensitive and difficult jobs on behalf of a person or as help.” Or at least the Gulf News notes that “such robots” as this are designed like that. Which doesn’t necessarily mean Surena 2 is. This vagueness comes from the extremely tight-lipped news coverage about Surena 2 inside Iran itself. He’s apparently capable of “Walking slowly like human beings” and “regular arm and leg movements are among its characteristics” which tells us that at least the ‘bot is able to walk–though we don’t know if he’s got actual natural gait, with free-falling footplacements like Asimo, or if he performs a simpler balanced one-foot-permanently-grounded walk (we’re guessing the latter, given the word “slowly.”) The overall design sure does look like Asimo, though. Sorena 1 incorporated about the same degree of sophistication as the android robots that came before the first-gen Asimo unit from 1986. In fact, that’s being charitable: The fact that Sorena 1 was humanoid-shaped is irrelevant to his wheeled-foot design. For Iran’s scientists to have made the necessary leaps and bounds in R&D in just two years to develop the new ‘bot seems absolutely incredible–impossible even. Asimo’s been in production for 24 years. Iran is, after all, a nation that’s building nuclear capabilities, so they’re advanced in some areas of scientific research. But robotics?